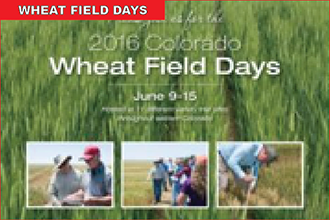 The 2016 Colorado Wheat Field Days will be held June 9-15 across 11 different variety trial sites in eastern Colorado. From Brandon, north 6.4 mi on CR 59, west 2 mi on CR W, south 0.25 mi on CR 57. From Burlington, south 7 mi on Hwy 385, west on CR L for 1 mi, south 0.4 mi on CR 47. From Briggsdale, 13.5 east on Hwy 14, then 13 mi south on WCR 105 (MCR 4). From Prospect Valley, go east 8 mi on Hwy 52, north 1 mi on CR 85, then east 0.3 mi on CR 14. From Haxtun, go south on Hwy 59 for 17 miles, east on CR 57 for 0.75 mi.